This is merely to say that the personal and social consequences of any medium—that is, of any extension of ourselves—result from the new scale that is introduced into our affairs by each extension of ourselves, or by any new technology. He uses the example of the electric light which has no content but the medium, the light, controls human communication and association and is a message in and of itself. We can analyze the advantages and disadvantages of different media and the messages that they convey to us. Markdown, as well as every medium, is a double-edged sword with affordances and drawbacks. We can’t just look at the content of the documents in Markdown, but also at what the use of Markdown itself conveys to us. One clear disadvantage to using Markdown is the lack of ways to design your file. While with Microsoft Word you can choose from a variety of fonts, font sizes, text colors, or formats Markdown offers a very simplistic view of what a document can look like. As well, we are exposed to Word from a very young age while Markdown takes longer to get the hang of as it is more unfamiliar. On other word processors you also have it spelled out for you what you are making the text do, while on Markdown you have a code to follow that you need to memorize. 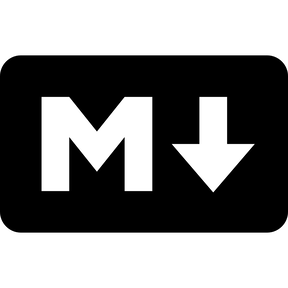 Like any form of media Markdown offers advantages and drawbacks because it doesn’t just matter what the content of the file is. The program itself is significant because the message is in the medium too.